The Blackhawks and Blues square off on Wednesday in Game 4, with Chicago looking to even up the series at two games apiece. The Blackhawks are coming off a 2-0 shutout effort on Monday, marking Chicago’s 12th playoff win on home ice since the start of the 2013 postseason, after going 11-2 in the 2013 Stanley Cup Playoffs. Jonathan Toews and Marcus Kruger tallied in the victory, while netminder Corey Crawford stopped 34 shots to cut the Blues’ series lead to 2-1. With his whitewashing of the Blues on Monday, Crawford recorded his third career postseason shutout in 40 appearances. The blanking also moved the 29-year-old netminder into a tie for third place in franchise history; only Hall of Famers Tony Esposito, Glenn Hall and Charles Gardiner have more playoff shutouts than the Blackhawks’ present starter. After three games in the 2014 playoffs, no goaltender has more than Crawford’s 109 saves, and his .932 save percentage is good for fourth in the league. 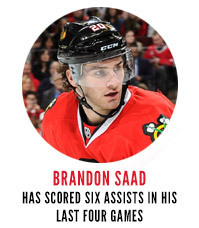 During the 2013-14 regular season, the Blackhawks ranked 28th in the league with an average of 8.5 penalty minutes per night. The postseason has been very different, at least through three games, with Chicago racking up 18.3 PIM per game, while St. Louis has logged an average of 13.3. Despite allowing plenty of chances, however, both penalty kill units have held strong: Chicago has killed off 15 of 16 shorthanded chances, while St. Louis has stopped 13 of 14. As solidly as both units have played, a power-play tally or two could swing a game – maybe even the series – for either side. Re-teamed with Patrick Kane on the top line, Toews returned to the scoresheet, netting the eventual game-winning goal in the first period; the game-winner was the captain’s seventh of his postseason career, just one behind Jeremy Roenick for Chicago’s franchise record. Toews also won 19 of 24 draws on the night, leading the team to a 59 percent faceoff winning percentage in Game 3. While the series so far has been marked by tough defense and great goaltending, it’s also been a showcase for selfless play and physical toughness from both sides. Bryan Bickell’s 21 hits leads all skaters in the series, but St. Louis’ Adam Cracknell and Steve Ott each have 14 to their credit, and all three enter Wednesday’s game among the league’s top 10 in that category. On the defensive end, Niklas Hjalmarsson (14) and Alex Pietrangelo (12) are neck-and-neck in the blocked shots total, with Duncan Keith (11) and Michal Handzus (7) not far behind. In Monday’s Game 3 victory, the Blackhawks truly made their home ice an advantage, capitalizing on their line changes and getting more of the matchups that they wanted. But even with that edge, the margin was as slim as ever; the Blackhawks didn’t get their second tally until 20 seconds before the end of regulation, with St. Louis’ Ryan Miller pulled for the extra attacker. After three postseason games, these two bitter rivals have played three one-goal affairs; going into Game 4, and for as long as this series goes, it’s safe to expect goals to be at a premium, with one or two lucky – or unlucky – bounces deciding each subsequent contest.